I've had three fishing trips recently. On the last occasion my pal Rob and I found the sea calm but with a huge ground swell. The swell was crashing against the cliff and the surface of the water was in turmoil. We were not optimistic and as it turned out we were correct. I had one pllack strike at a large Redgill and missed two or three slight knocks. That was it! Disappointing! To return to my first trip - it was the second decent tide in a series of springs. 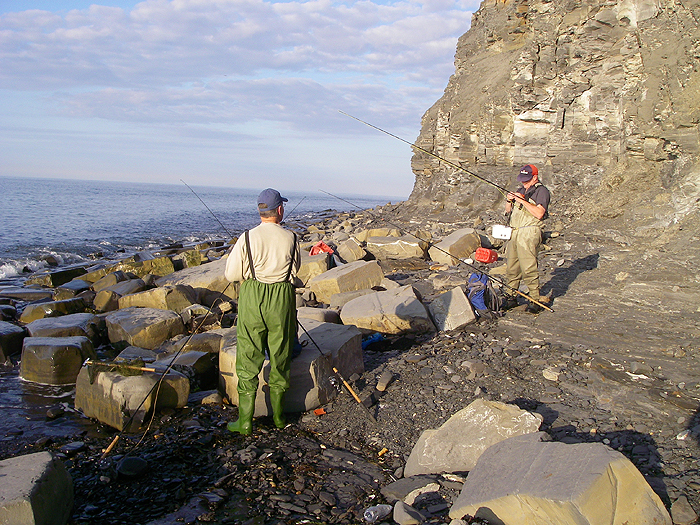 Nigel and I had opted to try for mullet and/or bass although we knew that there was little maggoty weed on the shore. We were joined by another pal David Harper who is still learning the ropes but dead keen. Sure enough the maggots in the weed middens were well seperated from the incoming tide by masses of fresh kelp. 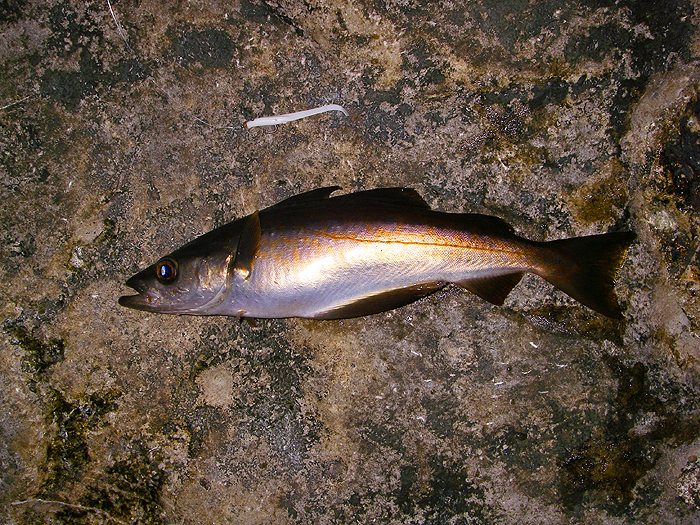 However, we threw some maggots into the sea and bashed on and as high water approached mullet appeared. 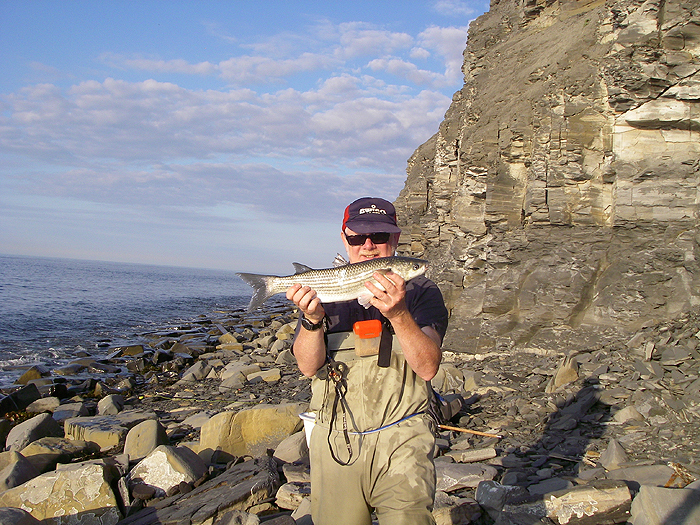 The bass seemed to be non existant but Nigel persevered with his fly gear and eventually managed to hook a mullet. As he described it "A three pounder that thought it was a six pounder." 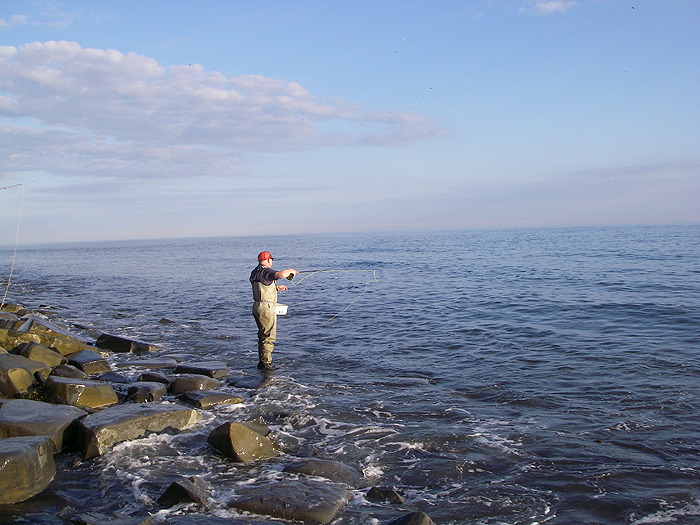 The fish fought like a tiger and it was some time before he was able to bring it ashore. I took a few pictures and he slipped his fish back - that, it appeared, was that apart from a tiny schoolie that took David's lure and really cheered him up. Of course we were disappointed not to get any more bites but that's fishing. My other trip was totally different. I was up early and on the shore by 03:30. Needless to say I was on my own (not many people like getting up at 02:30 to go fishing). The sea was flat and the tide was out. Every stone and blade of kelp was visible in the clear water once it became light enough to see. I began flicking out my fly line in the gloom and nothing happened for a while so I switched to spinning with a Maria Chase. After a few casts the lure was grabbed by a decent pollack (perhaps 3lb) which struggled for a while before shedding the hook and escaping. Bugger! I immediately switched back to the fly gear and it was only a minute or two before I was into a fish, a pollack slightly smaller than the first one but excellent sport. 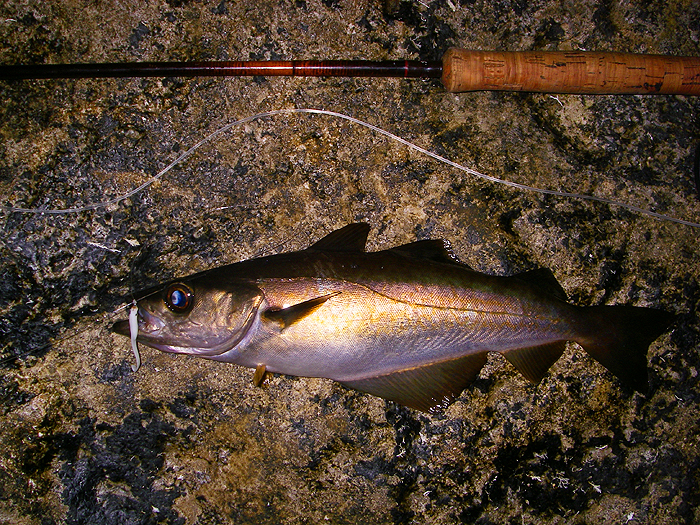 After that things pepped up and in the next half hour I landed nine pollack of various sizes - all on the fly tackle. I went home well pleased. I guess what it shows is that you can't win 'em all.